TUNKHANNOCK, Pa. -- Extensive repairs and a thorough cleaning have removed the physical traces of a mass shooting inside a Pennsylvania supermarket, but it'll take more than a makeover to erase shoppers' memories of what happened in the aisles. The Weis Markets Inc. store in rural Tunkhannock, about 135 miles northwest of Philadelphia, is scheduled to reopen this week, more than a month after it was turned into a triple-murder scene by a 24-year-old gunman who had expressed violent and suicidal thoughts online. The regional supermarket chain is planning a low-key 6 a.m. Thursday reopening of the store, with no public ceremony, though there will be a private event for employees. But people in this small town are still talking about it, and opinions are divided over whether the store should have been torn down. The family of at least one victim wants it gone, saying the building holds too many painful memories. Judy Nulton, of Tunkhannock, who was shopping at a Walmart down the street, said she'd avoid Weis because of the shooting. "You just won't feel the same when you walk in there. I would feel bad going through there," she said. "Whatever they do, that's going to be on your mind. It's not going to go away." The store was closed to customers when gunman Randy Stair, 24, of Dallas, Pennsylvania, took two pistol-grip shotguns to work, blocked the exits and began shooting shortly before 1 a.m. on June 8. He killed three co-workers - firing a total of 59 rounds that also wrecked merchandise, counters and other parts of the interior - before turning the gun on himself. State regulators walking through the supermarket hours after the shooting noted "damage to the entire facility" and ordered Weis to toss all food and other products that might have been contaminated. The food retailer hired a restoration company to clean and sanitize the store, and then did an extensive remodel that included new paint and decor, a renovated employee break room and restrooms, and some new cases and shelving. Every item of merchandise in the store was replaced. Less than three weeks after the shooting, the Pennsylvania Department of Agriculture cleared it to reopen. The family of shooting victim Terry Sterling, 63, of South Montrose, says no. "We don't like it because of what happened," said Laura Elliott, the longtime companion of Sterling's son, with whom she has two children. "It brings back too many memories. It should be torn down and moved." 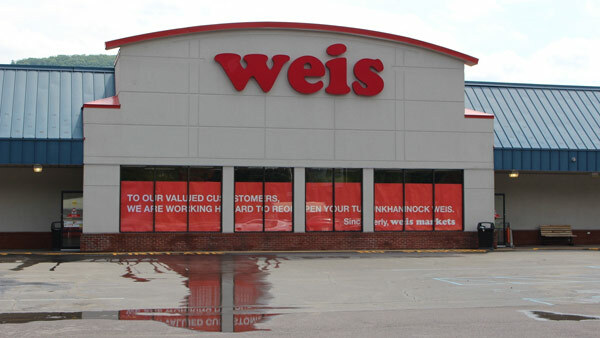 Weis spokesman Dennis Curtin said the last month "has understandably been an extremely difficult time for the victims' families, our associates, and the community, as we all dealt with this senseless act of violence." But he said "closing our doors on this location was never an option." The Sunbury-based company, which has more than 200 stores in seven states, has operated a supermarket in Tunkhannock for a quarter-century. "The people of Tunkhannock have offered overwhelming support for the reopening of our store, and we are truly grateful," Curtin said. Weis said it is discussing ways to honor the memories of Sterling and the other two slain employees, Victoria Brong, 26, of Factoryville; and Brian Hayes, 47, of Springville. Other mass shootings have resulted in different fates for the buildings where they took place. Sandy Hook Elementary School in Connecticut, as well as an Amish schoolhouse in Pennsylvania, were torn down after massacres of schoolchildren. A movie theater in Aurora, Colorado, reopened six months after a gunman killed 12 and injured dozens, leading to protests from some survivors. The owner of Pulse nightclub in Orlando, Florida, plans a memorial at the site of one of the deadliest mass shootings in U.S. history. In Tunkhannock, the buzz and whine of saws came from the supermarket's interior a week ahead of its planned reopening. A large sign hung across the front windows that said, "To our valued customers, we are working hard to reopen your Tunkhannock Weis." The store's 88 employees have been paid as usual during the cleanup and renovations, and most if not all are expected back once the store reopens, according to Curtin. Some people said the region could scarcely afford to lose an employer. "You need business. It was a terrible situation, but people need work to make it around here," said Summer Frantz, 19, of Harveys Lake. Wyoming County Commissioner Judy Mead said a Weis worker told her she is eager to get back to work. "She thinks of it as her market, and her customers," Mead said.